We do know that on December 21, 2012, even astronomers say there is going to be this alignment between the Earth and the Sun with the center of the Milky Way Galaxy for the first time in 26,000 years. The Mayan's knew that, I mean, that is staggering that they knew that! The problem is they knew a lot about calendars and a lot about astronomy, but they didn't know the future, and that is the problem with any end time date setting scenario. Even their ziggurats were supposed to be living calendars. One of the largest ones they have has 91 steps on each of the four sides, and including the top, that equals 365 steps. On the spring solstice of March 21st every year at the big Kukulcán Ziggurat (pyramid) down in Mexico, when the sun hits it at 3 o'clock in the afternoon, the shadow on it looks like a serpent that wiggles down the stairs and comes down to this big serpent head at the base. 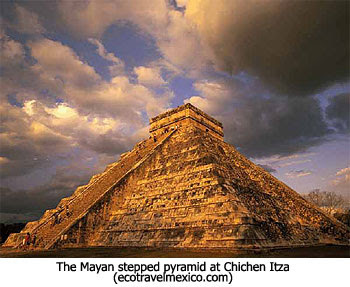 The Mayans were able to position the ziggurat where that shadow would move to the right place— absolutely stunning! Then you've got Nostradamus. He always seems to be everywhere all over the History Channel. You also have Bible codes. Some people point to computers and the Web Bot Project. They say that points to 2012 as well. There really is good science behind the solar flare idea. The Sun goes through sun spot cycles. Every 11 years there is a sun spot cycle. Some of them are much more dramatic than others. We are due supposedly for a very dramatic sun spot cycle. The last time there was one this dramatic was the last 1950's, but that was back before we had satellites and a lot of the complicated electrical grid that we have today. And so, we really don't know what is going to take place. There are some things that could happen related to that, but it is not going to be a mass extinction event. I need to emphasize, I'm not saying that there couldn't be something that happens in 2012. Every year there are some unusual things that happen, but it is not going to be the Second Coming of Christ and it is not going to be the end of the world. That is the thesis of my book 2012. Also, the Earth is protected by our atmosphere from solar flares, so it's not like they are going to erupt and melt the planet or anything. At most it is going to be electrical disruptions. Now, how large they will be, no one knows. If there is enough disruption of the electrical grids it could be significant, but again it won't be a mass extinction event like so many are saying. After that insulting and outrageous French comment it forces me to say maybe we shouldn't have "occupied" France in WWII and left them under the rule of Hitler. (Not my true feelings - a sarcastic and yes, angry reply to show how disgusting their comment was). Since when does the Frenchs' opinion of us matter? These are the same bunch that complained when we invaded Iraq -- only because they didn't want us to find out they were in cahoots with Hussein! I wondered if you might consider the kids from England, Ireland, Scotland, Wales, Canada, Australia, NewZealand, S.Africa, Palestine ... fighting for France, Belgium, Natherlands ... long before the US kids were sent over to join the other kids as canon fodder while their homes and families were being raized to the ground and their lifeline of merchant seaman kids were sunk? ...and the intended purpose: the final, most horrific world war will create the world's total disillusionment of the 3 gods who didn't show up to deliver; YHVH, the God of the Jews, Jesus, the God of Christians, & Allah, the god of Islam. Fortunately... [Fortunately?!?] 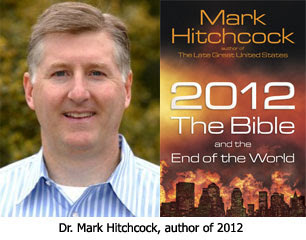 In God's mercy & predestinated [before the creation] plan it doesn't play out exactly the way these Bozos hope it will. I am certain you meant no offence :) Its just that much older Brits can be a bit touchy about certain factors during the war. For example, in certain films, there is a tendency to make it seem as if the U.S. with John Wayne won the war all by themselves. We all did it together, with God's help for certain. Praise the Lord!